I'm channeling a bit more sparkle today, with three new cards, that all feature the same stamp. I wanted to do a different take with each card, so I'm sharing all three with you today! First up, I used a dash of cool color with a striped paper for the background. It's still very much winter around here, and these shades add a really frosty and fresh look to the card! Because I wanted to keep the card fresh and simple, I used a plain white star die-cut from PTI's Seeing Stars dies as a large focal point. 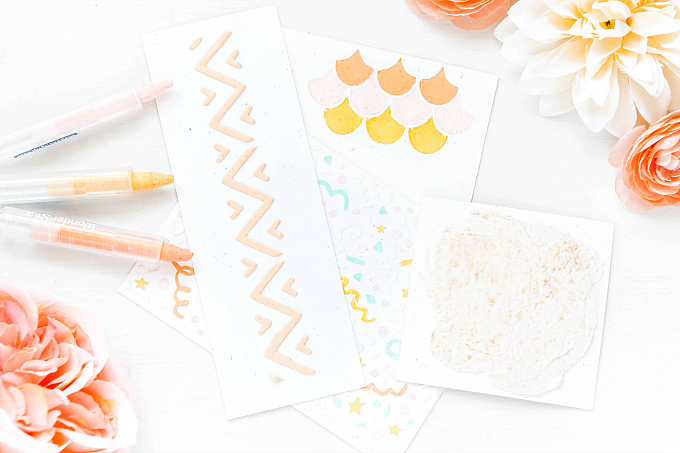 To the star, I added a soft, flowy white flower, and an adorable Tiny Tag from Papertrey Ink. I used the same sentiment die-cut, stamped in two different colors, along with one left au-natural, to layer up. I stamped the sentiment in shades of Lemon Tart and Aqua Mist from Papertrey Ink. And can I just say - I'm really quite fond of this Hero Arts Thanks Stamp & Cuts set! 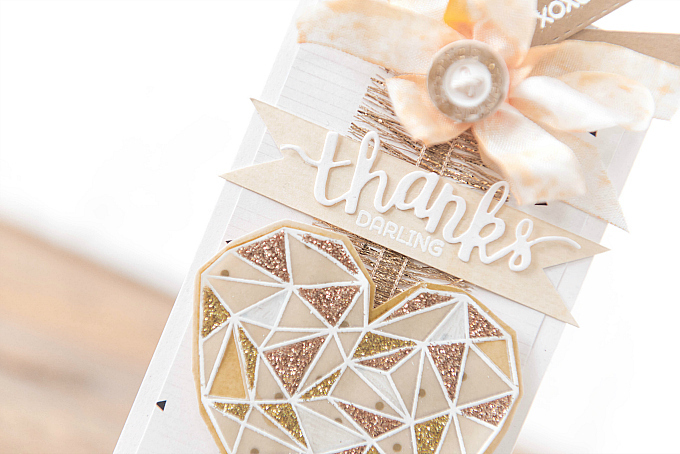 At the bottom of the card, I added the feature stamp - a beautiful geometric heart from Neat and Tangled Heart of Gold stamp set. I absolutely love this stamp! 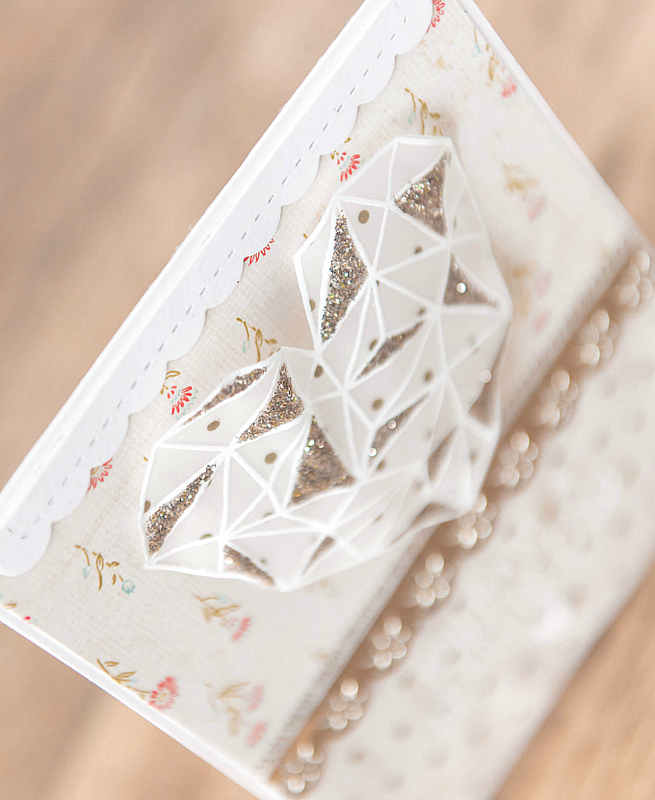 Especially embossed in white, with a few fussy cut glittered bits as accents. I added a few sequins and some liquid pearls to the card as the finishing touches. For this next card, I opted for a more neutral look. 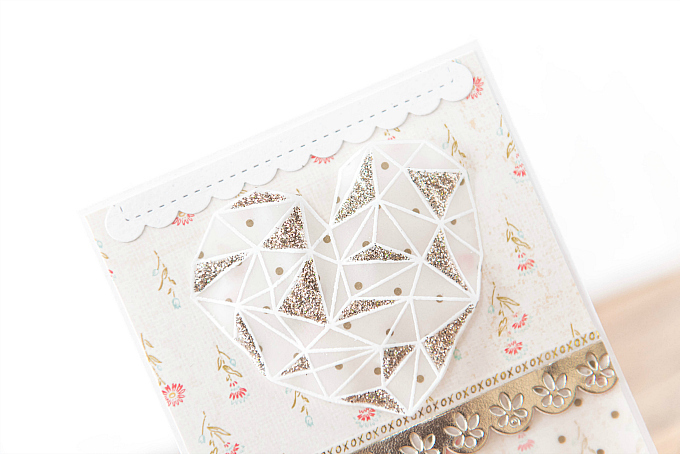 I really wanted to play with the different facets of this heart stamp a bit more so I used a variety of glitters - platinum + gold - to add a bit of shimmery goodness. I also decided to cut a few little bits of the heart out with a craft knife, to reveal the shimmery base underneath, which I created with a golden chalk palette from Pebbles I Kandee Chalks. The heart itself was stamped on gold-dotted vellum and embossed in white. For a finishing touch, I used a white chalk pen to color in a few of the bits. At the top of the card, I added a little kraft banner, cut using Papertrey Ink's Tag Sale: Quilted Tag die. For the 'xoxo' sentiment, I used Papertrey Ink's Swoosh stamp set, and for the tiny heart, a wee die cut from PTI's Love Lives Here. I used the Hero Arts die here again, and the Swoosh stamp set to finish off the sentiment. 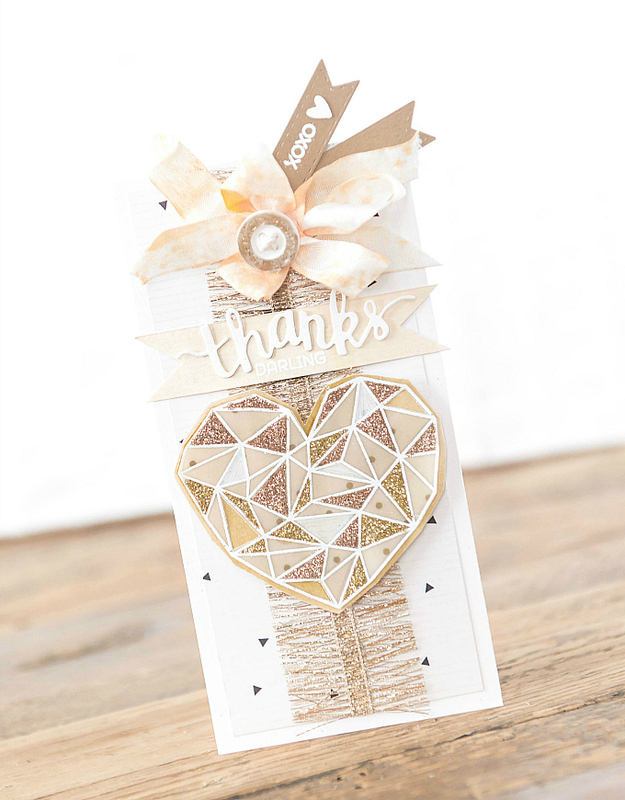 I backed the card with a lovely gold fringe and simple triangle print. I'm loving how this card sparkles in every direction! For the last card, I used the same Heart of Gold stamp, embossed in white on dotted vellum, but decided to use some of my favorite Mercury Glass Stickles to accent the heart. What I love about this technique is that the wet nature of Stickles will buckle the heart just enough to give it a beautiful wrinkle, which is exactly what I was going for! To liven up the card a little, I used a soft floral print, and a scalloped edge at the top of the card. 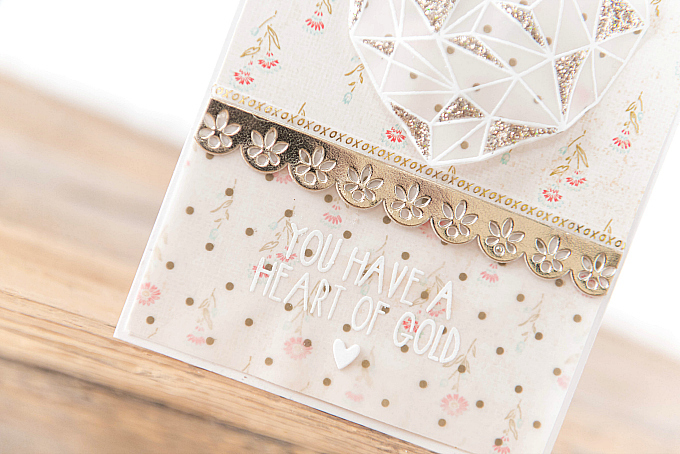 At the bottom, I used the sentiment from the Heart of Gold stamp set, along with a tiny diecut heart. A bit more bling with the scalloped Gold Faux-Leather Trim from Hobby Lobby, and delicate washi tape border. A wee close up of how dimensional the heart looks after the Stickles glitter has dried. I love this look! Thanks for joining me today friends. You're incredibly creative, Ivana! 3 gorgeous cards with such wonderful elements! 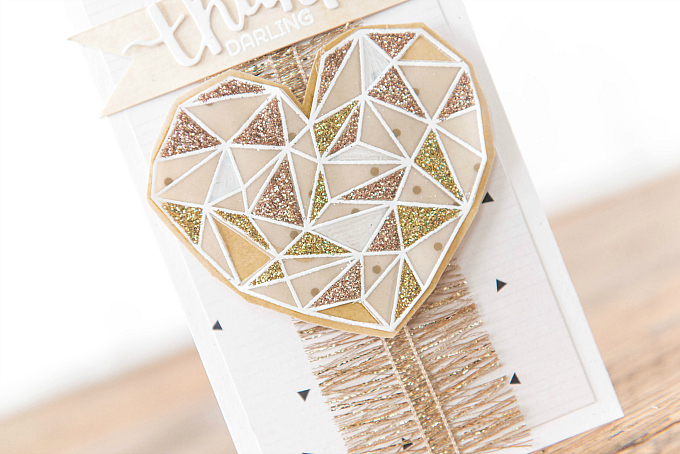 I love all the different looks of that neat heart & the gold fringe is such a unique, wonderful embellishment! Beautiful projects! Love all the shimmery gold details!